Christopher Hawthorne Moss wrote an earlier edition of this novel under his former name, Nan Hawthorne. As Nan put it, “I want to write a female character I can finally relate to.” The irony of statement is that writing this novel about a woman knight was one of the most profound elements in a personal journey that led Nan to recognize that s/he is transgender. To coin a phrase, the sort of female character s/he could relate to was really a man down deep. 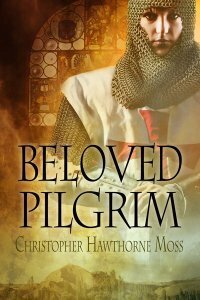 Christopher Hawthorne Moss is that man, with 60 years of pretending to be a woman to himself and the world to readjust. That is why he decided to take the novel and make it about a woman who realizes she is a man and is given the opportunity to live as one, a rare blessing in the Middle Ages or any time. In this excerpt, Elisabeth and her squire Albrecht have just fought off an ambush as they journey to escape threats to their lives back at home in Bavaria. Her first kill leads her to recognize a profound truth in herself, a long-held conviction that she is in fact not a woman but a man. As she prepares to join the ill-fated Crusade of 1101 she takes the name Elias and determines to be everything a man should be. As they returned to the road, she realized she still had her sword in her hand. She raised it to sheath it and saw the blood. Startled, she looked over to see that he had tossed her his neck kerchief. She snatched it out of the air. “Clean your sword,” he said. The kerchief was clotted with blood and worse already, but she wiped away as much as she could before sheathing her sword. She turned to watch as he prepared to go on with their journey. Not serious? she thought. Is he right? Do I have any idea why I am here? Or where I am going? Elisabeth grew silent as they continued on the road. The killing of the brigand had shaken her, but not the way she thought it might have. She realized as they rode that she had not hesitated to fight, to raise a real sword and intend to kill. She tried to tell herself it was simple practicality, that in such dire circumstances anyone, and more to the point, any woman would do the same if her life was at stake. But no, that was not necessarily true and besides that was not what struck her now. She had not risen to the occasion. She had been ready for it. It felt natural to her, if not exactly pleasant. A girl would not feel this way, she thought. Elisabeth reflected on all the times she had felt wrong in her own body. Did I ever accept my lot as a girl? I can’t remember a single instance when I was not chafing at my skirts, wanting to run and climb trees and be loud. When I was little I was often punished for taking off my skirts and running around in a tunic and my hose, just like Elias dressed. And how I fretted over the restrictions Mother tried to place on my behavior. The only way I got through it was the freedom Mother’s illnesses gave me. She recalled a time, when the twins were small, that Elias had flatly refused to believe when a servant told him Elisabeth was not his brother. They had grown so similar in every way that the two regarded the anatomical differences as mere individuality, not of any significance. In fact, Elias had taught her how to pee standing up. She made a mess of it every time, but so what? She was better at some things, and he at others. After his hot denial of her girlhood, Elisabeth noticed her brother spent a fair amount of time looking at her and then at village girls, seeming puzzled that his sister in no way behaved like even the most boisterous of the girls. Wearing these clothes, this armor, relaxing and swearing, and then acting on the need to kill, they all feel right. In fact over the past days, I have never felt more genuine; more right in my own skin, more me. The feeling was so strong, so clear, that Elisabeth did not even try to puzzle out how it could be, how she could have a woman’s body but know in her core she… no, he was a man. It felt true, truer than anything else she ever had felt. What path could Elisabeth possibly follow seemed clear at this juncture. It was a gift, this quest, this opportunity, a chance to be the man I always knew I was to be. They found themselves where a small pier jutted out into the flow of a huge river. “The Danube?” Elisabeth asked. She gave him an odd look, but did not say any more until the light had gone and they were ready to roll up in their cloaks and sleep by their campfire. “Albrecht, I have to tell you something,” she began. Copyright © 2014 Christopher Hawthorne Moss. All rights reserved. Christopher Hawthorne Moss wrote his first short story when he was seven and has spent some of the happiest hours of his life fully involved with his colorful, passionate, and often humorous, characters. Moss spent some time away from fiction, writing content for websites before his first book came out under the name Nan Hawthorne in 1991. He has since become a novelist and is a prolific and popular blogger; he is the historical fiction editor for the GLBT Bookshelf, where you can find his short stories and thoughtful and expert book reviews. Moss is transgender, having been born with a female body but a male heart and mind. He lives full time as a gay man in the Pacific Northwest with his partner of over thirty years and their doted upon cats.